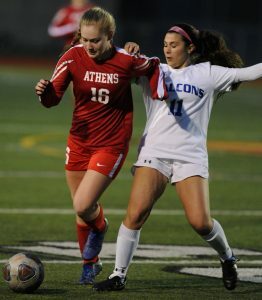 Led by the play of Mackenzie Smith and Kaitlin Ducharme, the Rochester Falcons opened the Oakland Activities Association Red season with a 3-0 victory over the host Troy Athens Red Hawks on Wednesday. The Falcons needed less than three minutes to get on the board when Smith fired a long ball over the top and Ducharme won the race to the ball, rounded the charging goalkeeper, and scored into the empty net for a 1-0 lead. Led by Smith and Ducharme, the Falcon counterattack would remain dangerous all night as the pair consistently caused havoc in transition, but especially in the first half. And eventually, Smith and Ducharme would make the Red Hawks pay again when the pair got loose on another counterattack, and a two-on-two break ended with Ducharme setting up Smith for a goal with 7:30 remaining in the first half. “As soon as we paired both of them together, they have been a dynamic duo and have been a part of all of our goals so far,” Falcons head coach Dustin Coleman said. Athens would make some adjustments at half time, and the Red Hawk midfield of Skyla Gebauer, Brooke March, and Nalia Gebauer would control play in the second half, recycling possession in midfield to largely choke off the Falcon counterattack and then directing the attack for the Red Hawks as Troy Athens pounded away at the Falcon net for almost the entire second half. But they might as well have been pounding against a granite wall. 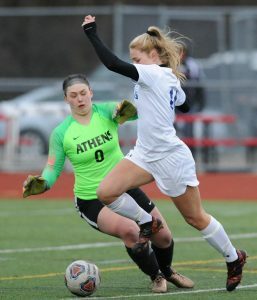 The Rochester defense was rock solid all night, blocking shots and clearing balls in front goalkeeper Kaitlyn Godwin as the Falcons seemed to ultimately win every loose ball in front of the Rochester goal. Godwin would finish with six saves to notch her thirty-fourth varsity shutout. Lily Cooper would complete the scoring late on yet another counterattack by the Falcons with the assist once again going to Smith. With the win, Rochester improves to 3-2-1 overall and 1-0 in OAA Red. Troy Athens (3-1, 0-1 OAA Red) suffers their first loss of the season. Both teams will now head out of town for tournaments on Saturday. Rochester heads to the Saginaw Heritage Tournament on Saturday where they will face Freeland, Davison, and Birmingham Groves. Troy Athens heads to the Lawrence Tech Invitational where they will play Ann Arbor Skyline and Trenton.